Monday, June 4, the United States Mint began selling the 2012 Silver Proof Set for $67.95, the same price as last year’s issue. Like all new releases, the core annual set went on sale at 12:00 noon ET. Collectors had to wait a lot longer for the newest set than they did last year, which launched in January 2011. There are 14 coins, all in brilliant proof condition, making up the proof set that comes in three separate lens cases. The proof finish shows more details because the designs are frosted and sculpted, and they seem to float on their mirror-like backgrounds. Seven of the strikes have the 90 percent silver composition which is similar to that of older US coins while the other seven are clad. In all, the proof set has 1.34 ounces of silver, which translates to a calculated melt value of $37.70 at silver’s current spot price of $28.17 an ounce. That places the set’s premium price above melt at just over $30. The first seven listed above — the half dollar, the five quarters, and the dime — are the silver issues. The 2012 Silver Proof Set will be very popular among coin collectors and fine gift-givers. The 2011 set is still available, and the latest figures have them at 561,425 as of Monday, May 28. When they started, collectors scooped up 209,367 between January 25 and January 30. A fast start is expected for this year’s set as well, since many are ordered via the U.S. Mint’s Online Subscription Program. The U.S. Mint Silver Proof Set may be ordered directly from the U.S. Mint online at its annual product page or by calling the bureau’s toll free number, 1-800-USA-MINT (872-6468). Hearing and speech-impaired customers may order by calling 1-888-321-MINT (6468). The shipping and handling fee mentioned earlier is $4.95 on domestic orders. Two other core annual sets preceded the Silver Proof Set this year. 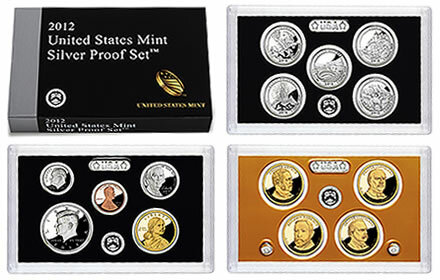 They were the 2012 Proof Set, which was released on May 7, and the 2012 U.S. Mint Set, which opened on May 21. So…pay for the silver content and get the other $5.06 in non-silver coinage for free? Sounds like a great way for the gov to lose more $. Maybe they’ll start the direct ship dollar coin deal again while accepting credit cards too!